2. 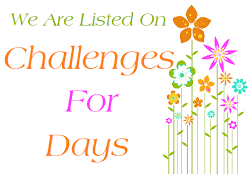 We have an exciting challenge that will last for 2 weeks!! 3. It's Friday, and well...Fridays rock!! CFC79: Create a CAS winter project featuring blue. Why 2 weeks you ask? I'm sad for us because she is such a fantastic designer, and seriously one of the sweetest people ever! What I'm not sad about is that she has been elected to a very prestigious steering committee in her real life job. It's really spectacular news and her life is swirling with possibilities right now. Gorgeous cards! Love the 'winter blues' theme. Beautiful sample cards for winter blues ladies! Best wishes for a bright future Suzanne! thank you for the opportunity to participate happy thankgiving girls!!!!!!!!!!!!!! Thanks for the amazing challenge and the superb DT creations for inspiration! :) LOVE them all!!! Beautiful projects from the DT..and some lovely entries already...you will have hard time picking this week I am sure!! Another great challenge--love the DT's samples! Best of luck to Suzanne! Wonderful inspiration from the design team!!! Thanks for the fun challenge. Lovely inspiration cards! :) Great challenge and wishing you all Happy Holidays! Thanks for the gorgeous inspiration ladies!! Yeah - really likin' this two-weeker. Even intend to be back with another card. Love all the variations of snowflakes in blue from the DT. Fabulous projects from the DT! thanks for the challenge! Just a gorgeous group of cards. Blue never looked so good.